Following Dr. Kaplan’s talk, UNM the residents retreat broke into work groups. I attended the one about emergency department patient flow. The UNM hospital handles 90,000 emergency room visits per year but suffers from major congestion problems. The number of hours of boarding patients as they await rooms on the medical floors has grown, and there are also a substantial number of patients (14%) who leave without being seen because of the waiting times. This is not an unusual problem in American hospitals, particularly the safety net hospitals, which face financial limitations in increasing capacity. As we all know from our Lean training, though, there are process improvements that can be made in virtually any setting. The purpose of our work group was to introduce residents to some of the Lean concepts. We focused in this session on sketching out a process flow diagram, or map, indicating the steps taken in caring for a patient. The idea is to identify all the steps and then determine the amount of time required to carry out each step. Two metrics are used: The net time is the actual time taken in carrying out a step; and the gross time is the fully elapsed time within which the task is accomplished, including all delays, re-work, and the like. In most organizations, the net time is a small fraction of the gross time. 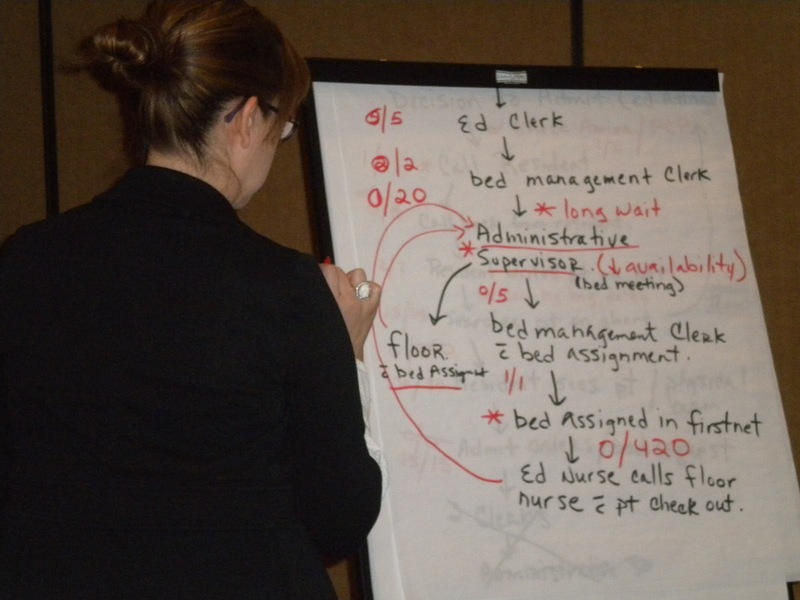 Here you see chief psychiatric resident Peggy Rodriguez keeping track as the group outlined the steps between when a decision is made to admit a patient and his or her arrival on a medical floor. Each discrete step is itemized, and two numbers are assigned. 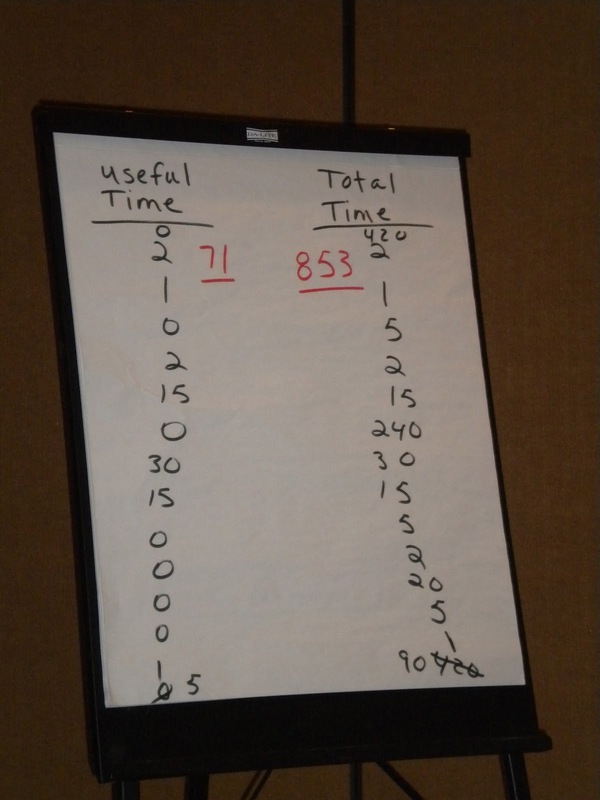 The one on the left is the net time for the task, and the one on the right is the gross time. 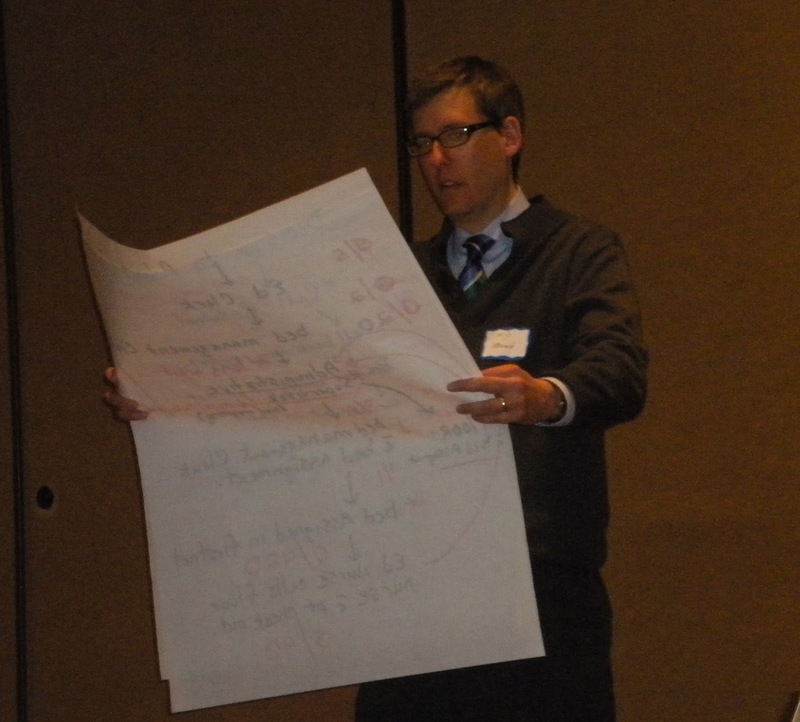 This map, though, was being set forth for instructional purposes, next you see Dr. Marc-David Munk, one of the leaders of the session, reading off the summary chart. Peggy kept track and prepared the following summary chart. Our rough analysis — just based on perceptions of people in the room — yielded 853 minutes of gross time spent per patient for work that had a value of 71 minutes. This is remarkably close to the 14 hour average delay that the ED has documented. The next step, if we were actually doing this in the hospital, would be to identify measures that could be taken to redesign the work flow and conduct experiments to see what would be helpful in extracting waste out of this overall process.